A monkey is a hairy primate who eats bananas, throws their own sh*t, and is generally a very cute creature by nature. Whilst 'The Monkees' are a bunch of Beatles inspired performers who starred in a Saturday morning television series, and this film too. You know, this surrealist one, Directed by Bob Rafelson; and Starring: Peter Tork, David Jones, Micky Dolenz, Michael Nesmith, and Jack Nicholson. It was made in 1968 and lasted for 85 minutes. As stated by some wise old Indian chap who has a very nice beard whilst draped in a rather fetching pair of curtains "The concept of reality is based on pent-up neurological memory, which inadvertently is fractured by normal human compression. Also, the here, the how, and the why, will always lead to confusion when dictated to by the past and the present". OK, I know what you are going to say. "That's a Funny thing to quote". Right? 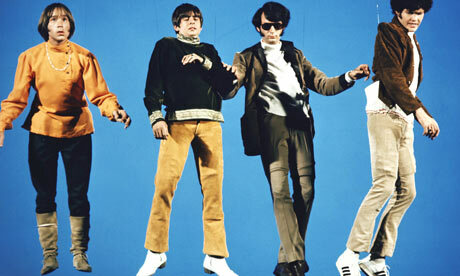 But then again the Monkees are in a very funny place at the moment. Oh! You do know who 'the Monkees' are, don't you? They're the musicians. They're the actors. They're the performers. Plus they're the manufactured pop-group who suddenly interrupts a bridge from being opened up, before one of them jumps off into the icy waters far-far below it. OK, "So who might this jumper be?" you may say again. Why it's none other than Micky Dolenz of course. The fuzzy haired drummer, who swims with the psychedelic mermaids, kisses a girl, until he emerges in the Sahara desert, and does battle with a Coca-Cola machine. "Strange" you say yet again! Well, if you think that is strange, you have to ask yourself if it stranger than when keyboard player, Peter Tork, has a skirmish with a Football player within a war-torn lo-cal? Or what about when guitarist, Michael Nesmith, is wounded in a fake country and western set, situated somewhere within a television studio? Or better yet, is it as strange as when song and dance man, David Jones, has a boxing match with someone he chooses to lose to for no apparent reason what so ever? Yes. That's correct. This is one of those adventures. One where the Monkees run, hide, disappear, fight, and sing to all in sundry. And is most probably the reason why what next transpires all dissolves into a smorgasbord of unreality and mirth. As villains feel like winning - musicians fell like singing - story's fell like spinning - and at the end of the day this yarn all resolves itself back at the beginning. Now have you ever had a fever before? You know what I mean -- the illness -- when your insides feel like their on fire, and you sense of being is not akin to the way you would normally be. Well, if you have, then you know what it's like to watch 'Head'. You see, in essence, this art-house film is the Monkees attempt at making their version of the Beatles 'Magical Mystery Tour' film (which came out a year before it). Basically it is a story with no story, many concepts, nice tunes, and a strange way of presenting a 'cinematic experience'. Listen, please don't get me wrong. I would not call this movie completely crap. Because it's not. Instead, I would classify this surrealist fantasy as a slice of cinema that is only for those people who have an 'acquired taste'. Like those guys and girls who like pineapple on their pizza for example. ADVANTAGE: (1) Quite a few of the scenes were very nice to watch in their own right, because they worked as a secular piece excluding the whole. (2) For my own personal taste, I did not mind the artsy vibe to this film. It was captured in a very conceptual and bold fashion -- like a living Daliesque painting. (3) Although the songs in this movie are not what I would call 'Monkee classic's', I did not mind them really, because they were all very groovy to listen to. (4) I did enjoy some of the Beatles references inserted within this film, very 'in joke'. Also, the circular nature of this tale was fairly decent too. DISADVANTAGE: (1) There is absolutely no story to this film. None. Heck, the only way you can tie all of the different parts together, is if you take the Swami's statement nearing the end of this flick, as the overall through-line. (2) On occasion some of the transitions between scenes were quite jarring. One minute one thing happens. The next minute something completely different happened. No logic. (3) Do not expect any of the vignettes to have a resolution to them. It does not happen. And this is one the main fundamental flaws with this piece. Hey! Do you know what? While I am in a bullet-point type of a mood, here, check out these film-related facts: (1) This movie was constructed one resort filled weekend when the Monkees, Bob Rafelson, and Jack Nicholson, brainstormed ideas into a tape recorder about what their next project should be. (2) This was Tor Johnson's final film. (3) Regrettably there were a number of pitfalls this movie had to endure during post-production. For example: the audience gave it a poor pre-screening reception, the picture had to be re-edited even if it was 'running short', plus the producers tryed to distance the Monkees name from this project. (4) Dennis Hopper hired Jack Nicholson to appear in 'Easy Rider' whilst Jack was making this movie. (5) Mike's party scene was shot on the same set built for 'Rosemary's Baby' [click here for review]. There was one hundred extras present plus a sculpture crafted by Edward Kienholz. (6) This flick did get some critical praise at a Jack Nicholson film festival five years after it was released. (7) The girl who kisses the Monkeys at the start of the film, Mireille Machu, was Jack Nicholson's girlfriend at the time. Jack was the co-writer and compiled the movie soundtrack for this project. (8) When the Monkees found out that they would be denied a writing credit for this picture, all but Peter Tork rebelled against making this it. Not that it did them any good. (9) The big box seen in several sequences within this movie; was used as a smoking room because nobody was allowed to smoke on set. Also, on a side note, this box was supposed to represent how the Monkees felt trapped within the confined of their own televisions show. (10) The Coca-Cola Company tried to take an injunction out on this film because the Monkees spoofed one of their commercials in it. Thankfully, this matter fizzled out over time [no pun intended]. 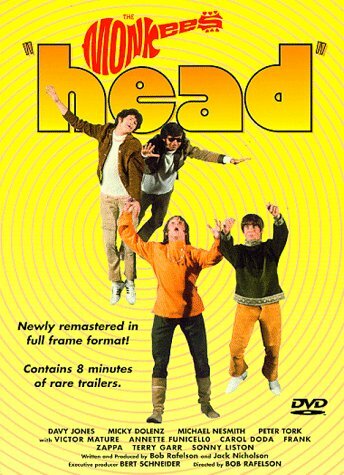 (11) A theory behind why this film was called 'Head', was because if a sequel would have been made, the new subtitle for this subsequent movie would have been '... from the people who gave you head'. Overall, 'Head' is a film for those moviegoers who have a rather alternate palette in movies. Please don't think of it as 'Here we come, walking down the street', but rather think of it as 'Here we come, riding a pineapple over a sea of jelly'. Moreover, this flick is well acted, well artsy, and well worth the watch for those who love a Monkee (click here if you do). Correct chaps?